Recently we introduced a new way to look at your data -- our Time Series view of Training Load -- where you can visualize how training load was incurred by your athletes over time. We are pleased to announce that you can now use this to segment your untracked sessions into sets or blocks. This will allow you to better understand how different portions of your sessions compare in Training Load, Intensity, Motion Load, Muscle Breakdown, Balance/Imbalance and Ratios. Switch the toggle next to Time Series on the left hand side of the screen. In addition to Time Series, this view also gives you easy access to Set Tagging. Click on the blue Set Tagging button in the top right hand corner of the screen. This will open a new view that will have your Time Series data with one large set identified labeled as Untracked Exercise -- before you can tag any sets, you will have to delete the Untracked Exercise set. Select the large Untracked Exercise set by clicking on the bar. Please note, that if you delete the large set and don’t actually create any new sets, you won’t be able to access the overall session metrics. Be sure that if you delete the Untracked Exercise set that you create some new ones before moving on. If you forget, you can always come back and do it later. Click +Add Set or Click and drag on the chart to define the start and end times of the set. Name your set. You’ll notice that once you have named a set once, this field will remember your set names so you can create consistent set names across workouts, allowing for better analysis. Use your own notes or click and drag on the Time Series view to enter the start and end times of your set. Please note, the sets cannot overlap. If you find you are having difficulty creating sets, please ensure that you’re not trying to create overlapping sets. If you forget to delete the one large Untracked Exercise set, you won’t be able to create any new ones because they will overlap. Continue like this until you have tagged all your sets. To see a video of adding, deleting and editing sets, click here. Once you have tagged your sets, you are now able to tap Return to Chart in the top right hand corner of the screen and then toggle the Time Series off to see the metrics for each of those sets that you just tagged. Single athlete Set Tagging creates massive value. Today, when you use a freeform workout in the Athos Mobile App or does a Athos Hub session with Core Pros, the result is a single session in the Online Training Center. In order to help you see your data more granularly we have introduced Set Tagging to break up that single session into multiple sets within the session. Set Tagging also has value for working with a few athletes and the whole team. 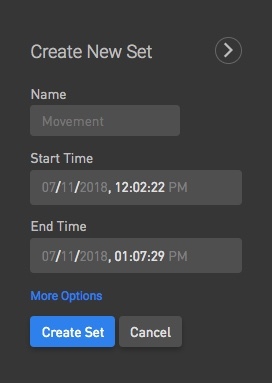 If you are working with only a few athletes, Set Tagging is designed to make that workflow quick and easy - mark where the sets were in the workout based on timestamps noted during the session or by using Time Series to see where the Training Load of the session was grouped. When you have a whole team, you may not want to tag sets for each individual athlete. For this reason, out Identify solution (Team Dashboard) helps you narrow down to few athletes you might need to take a deeper look at. Once the athletes that need attention have been identified, use Set Tagging to get a more granular view of their Training Load and movement patterns throughout the workout.